If you’re a developer, or a student, or a telco, or an enterprise interested in what telecom app development can do for you, this is the ticket for you. We have a limited number of free tickets. If you’re a developer / telco / enterprise and unable to attend in person you can still watch the live stream of TADSummit on the 17/18 Nov as well as take part in the remote networking. This ticket signs you up for the remote networking. If you’re a technology vendor and want to take part, but cannot sponsor, this is the ticket for you. 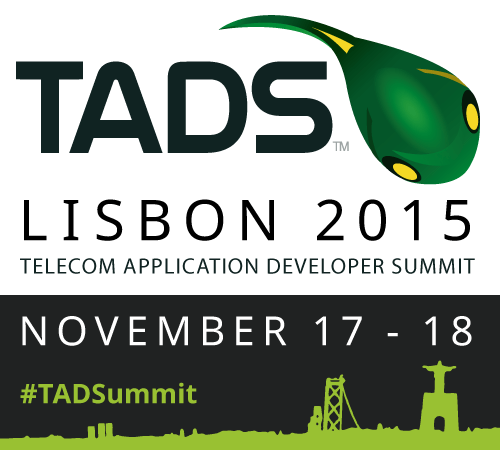 Tweet your followers about @TADSummit. Write a blog article about us. Include a link to us on your site (feel free to use our banner or logo). Then tell us about it so we can tweet about it and share it on our blog. Copyright © JAQ Events for TADS 2015. All Rights Reserved.